The legendary French Toile de Jouy fabric is the star print of this season! Toile stands for fabric and Jouy stands for Jouy-en-Josas, a village just south of Versailles, where the fabric was first manufactured. Leading the pack with the first collection of the year is Weekend Max Mara who collaborated with American artist Richard Saja on their “Trophy Day” Summer 2018 capsule collection. The richly embroidered pieces are inspired by the historic Ascot races. Richard Saja is known for delicately embellishing historic prints. His art has been exhibited in New York, Paris, London, Berlin and the National Museum of Embroidery in South Korea. Below I’m wearing a cream and red Toile de Jouy dress by Weekend Max Mara. I’m utterly in love with this gorgeous frock I snapped up whilst vacaying in Palermo with my Mum and hubby. To make this look more modern, I paired it with Superga sneakers and a brown, wide crocodile printed belt for a casual-cool yet elegant style. 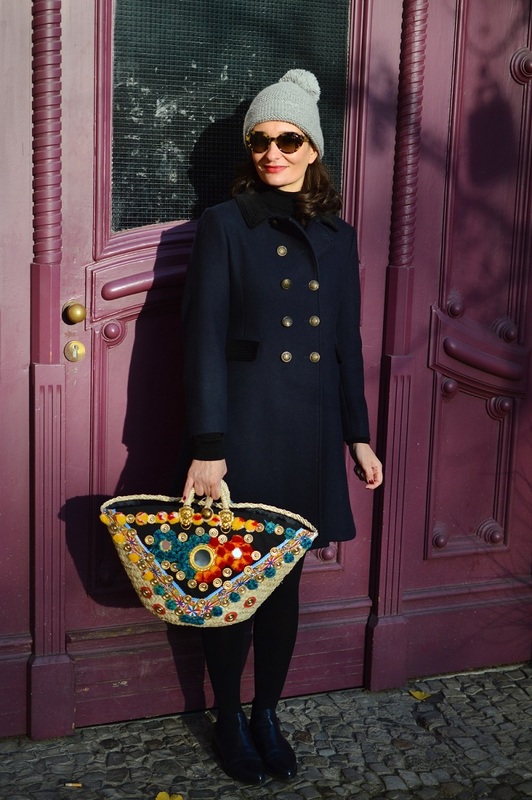 The perfect accessory to go with my dress of the same collection is my Sicilian straw basket Sicily Bag, handmade and embroidered, each piece is unique. I’m wearing the “Gigi” model in size medio. Amelia Windsor wore a Cruise 19 Dior red and white cotton dress with Toile de Jouy print. Toile de Jouy figures prominently in Dior’s 2019 resort collection: As a print, a jacquard, appliqué, embroiderred, in, satin, silk, lace, even on a trench coat. Meghan Markle wearing a Toile de Jouy dress by Oscar de la Renta, Resort Collection 2019. Aanais Demoustier attends the Christian Dior Haute Couture Fall Winter 2018/2019 show. She wore the gorgeous Toile de Jouy pattern on a fitted blazer and trousers. What a summer it’s been in Europe! Since April, we’ve enjoyed months on end of wall-to-wall sunshine. This can be challenging when faced with the daily morning wardrobe dilemma: What to wear? Meet the shirt dress, the sartorial all rounder to see you from spring, through summer and right into the golden rays of autumn. Dress it down with sneakers and a jean jacket or up with pumps and a blazer. If you think this hardworking wardrobe staple is too much of a safe (boring?) option, then check out the fashion houses’ 2018 interpretations. You can breath new life into the classic piece by adding whimsical elements. I’m wearing a Peanuts printed shirt dress by French Fashion House Paul and Joe sister (the heroines of romantic yet elegant fashion) in my favourite cut, nipped in waist and skater dress for that retro vibe. Embroidered pom pom bag by Sicily Bag. White leather espadrilles by Marina Rinaldi. 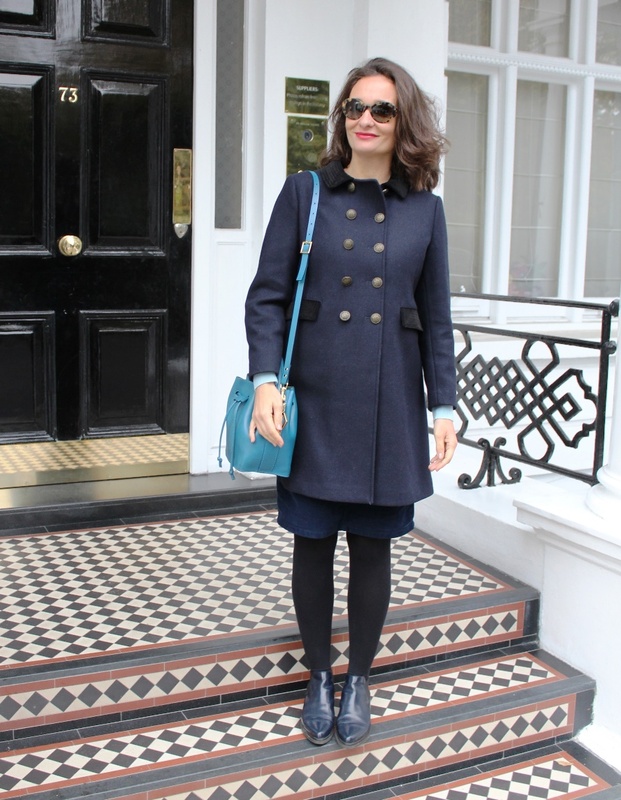 Love this Parisian street style version: Peter Pan collared, sky blue 50s dress. Who wore it better? Alexa Chung wearing a relaxed fitted shirt dress and a straw bag to beat the heat in New York. Rocking that romper by Max and Co. Straw bag by Sicily Bag. Phew, summer has flown by and now it’s time for the falling leaves, shorter days and chillier nights. 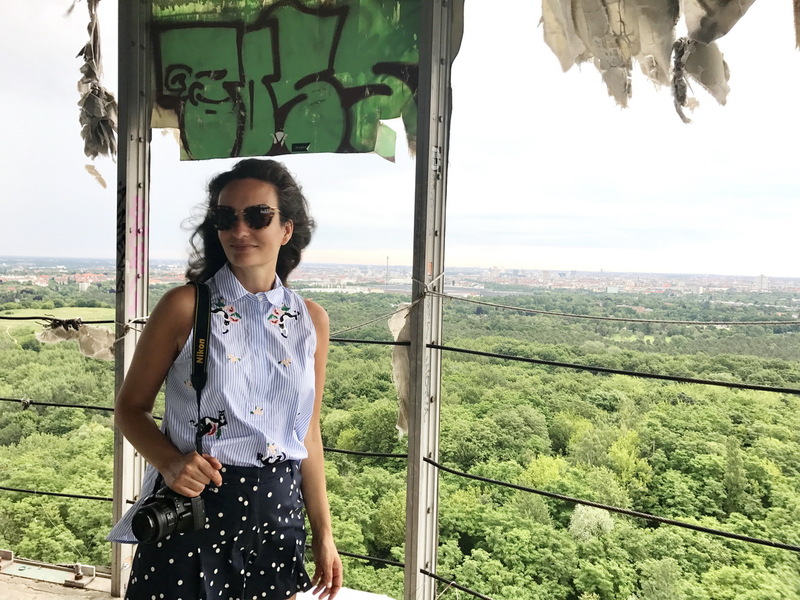 It’s been super busy for me, settling into my new job at Amazon as well as finding my feet in Berlin. The move from London last year still feels so fresh and raw and being a foreigner in my home town has had its challenges! When life gets busy like this, I’d like to grab comfortable yet stylish wardrobe staples. Taa da, meet the jumpsuit. It’s modern and looks pulled together without trying too hard. In summer, just wear it solo, in autumn, just throw on a blazer, a cardi, a denim jacket, a bomber jacket, a tuxedo, a leather jacket, I could go on and on. Dress it up or down, in sneakers or high heels. See, the options are endless! I love my jumpsuits to be made of comfy jersey material that doesn’t cling to the body but drapes around it in a flattering way. I prefer dark colours as they are slimming and make the jumpsuit look elegant and dressy from desk to Happy Hour! I’m wearing a two toned jumpsuit by Max and Co, sandals by Minelli and Sicilian straw bag by Sicily Bag. Lace coffa straw bag by Sicily Bag. I’m wearing: Cat blouse by Max Mara weekend. Denim by AG Jeans. 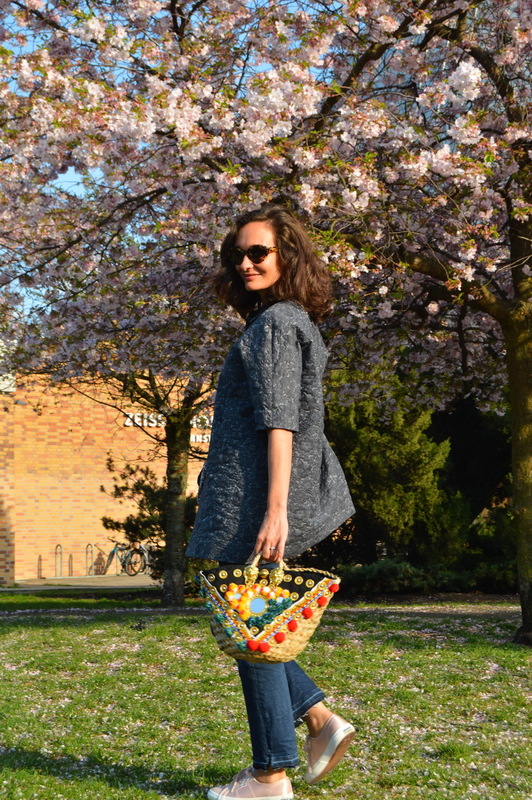 Straw basket by Sicily Bag. I’m overjoyed to see cat prints everywhere this season to add to my growing feline centric fashion collection ;-). 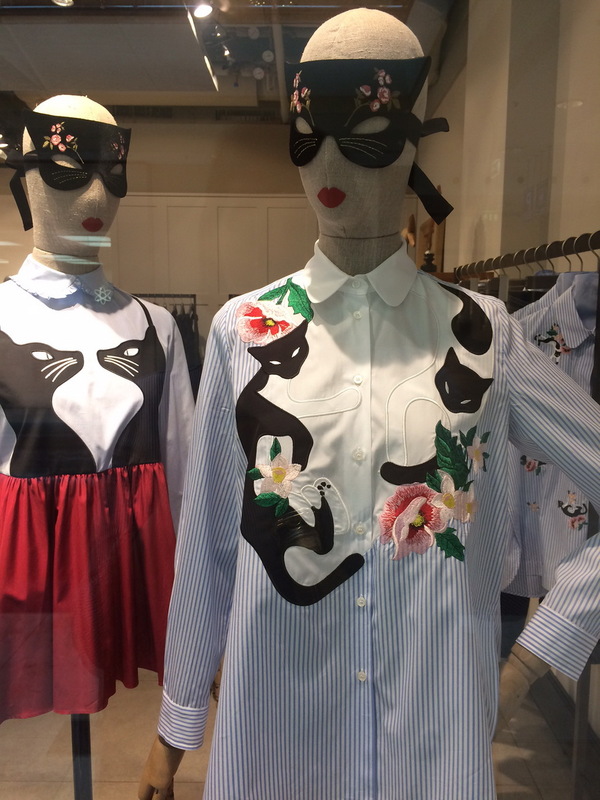 A maritime and breezy blue-white striped shirt topped up with a Peter Pan collar and embroidered cat prints? I’m in! Max Mara Weekend’s latest capsule cat print collection “Chatmise” epitomises all my dreams come true! Pair your stylish cat eye sunglasses with the playful print. If you’re unsure if you can pull this off, start with just a cat embroidered collar to ease into the trend. Cat embroidered collar blouse. Another delectable piece by Max Mara Weekend. Cat print blouse by Max Mara Weekend. Polka dot shorts by J Crew. Fellow cat lady Alexa Chung wearing a cat print dress by Louis Vuitton. The same applies to the classic trench coat. A permanent resident in your wardrobe and the ideal staple to stroll in the city when the autumnal wind is whistling or the spring rain is pouring down on you. 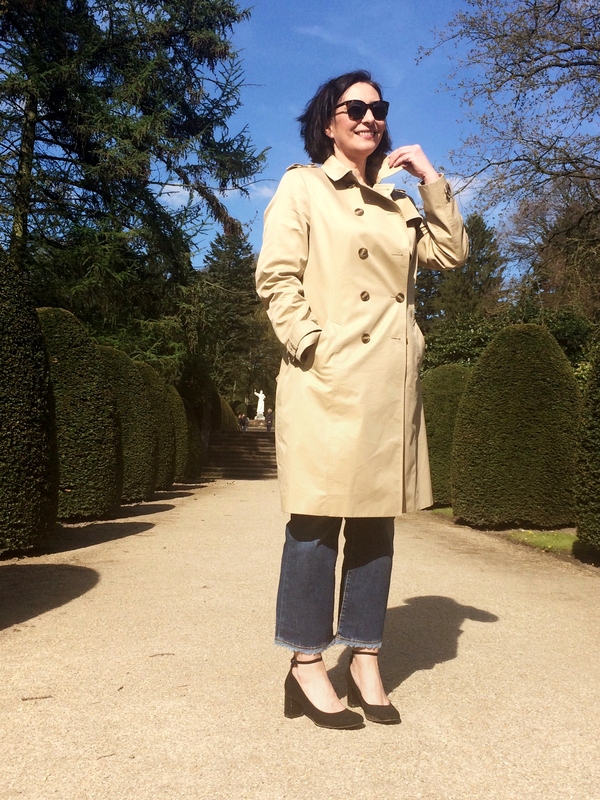 The best trench coats come in all shapes and sizes, from neutral shades in classic shapes to stand-out voluminous, textured and colourful styles guaranteed to liven-up your wardrobe. It’s a timeless classic I believe every girl should own. Yay! 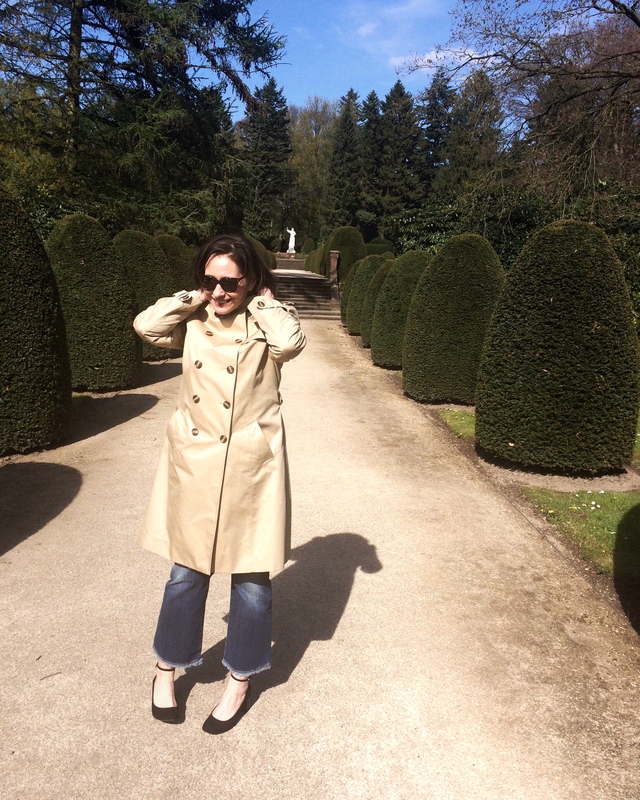 What seemed liked an endless, cold winter in Berlin is finally over! Now we play the typical April game of bouncing between sparkling summery weather and cloudy grey gloom! 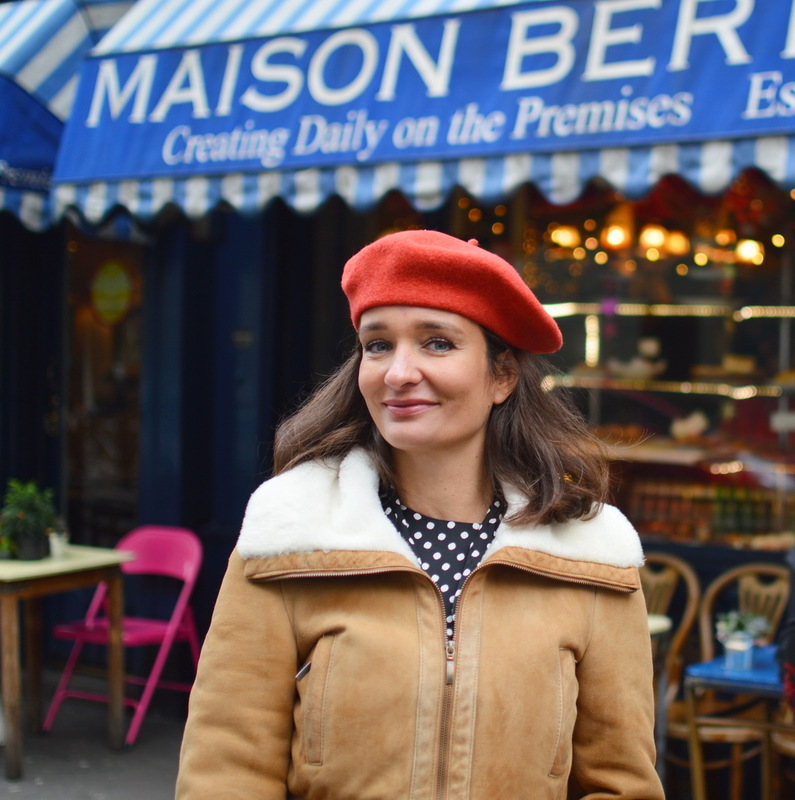 It’s time to hang up my snuggly arctic parka and opt for something lighter: My current key pieces are a cutesy kitten print coat and a waffle coatigan! Admittedly, you have to look closely to spot the kitten heads within the floral pattern of my jacquard coat by Paul and Joe Sister (The French designer known for Parisian chic with a twist and a dollop of kitten sweetness on top). Thanks to Rebel for snapping this up for me at TK Maxx! 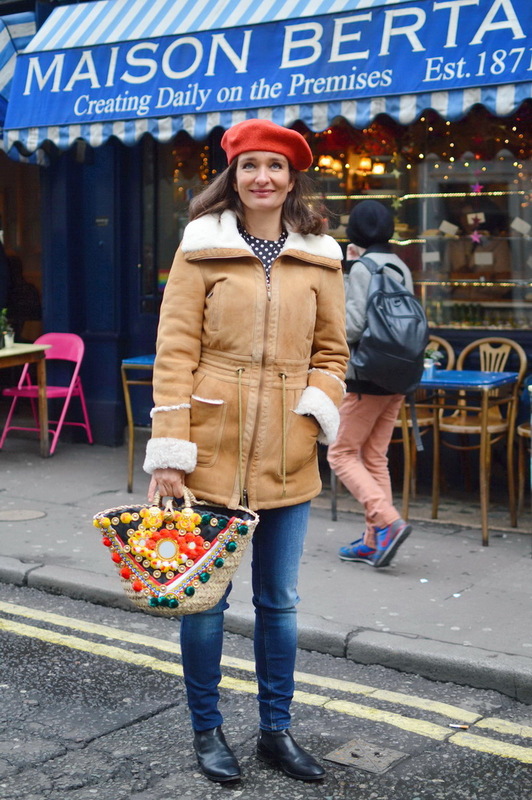 My other favourite spring coat is a Chanel-esque coatigan by Max & Co. A few years back I photographed a stylish Londoner wearing a similar quilted waffle coat in baby blue at Fashion Week. While she totally pulled this off, the colored pattern dangerously bordered bathroom robe chic. 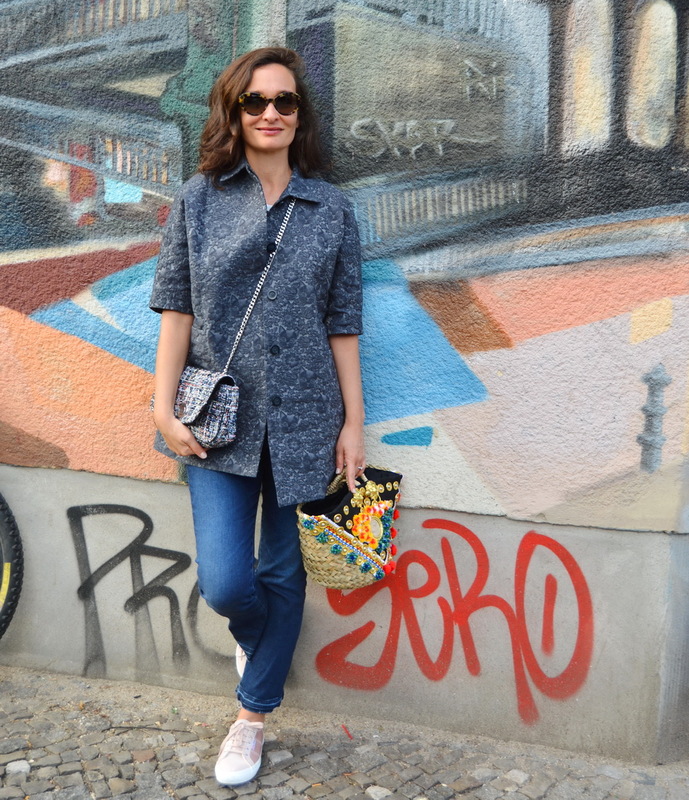 What I love about my coat is the easy wearability with dresses or denim, plus its black colour gives it a grown-up, elegant feel reminiscent of a black quilted chanel bag. 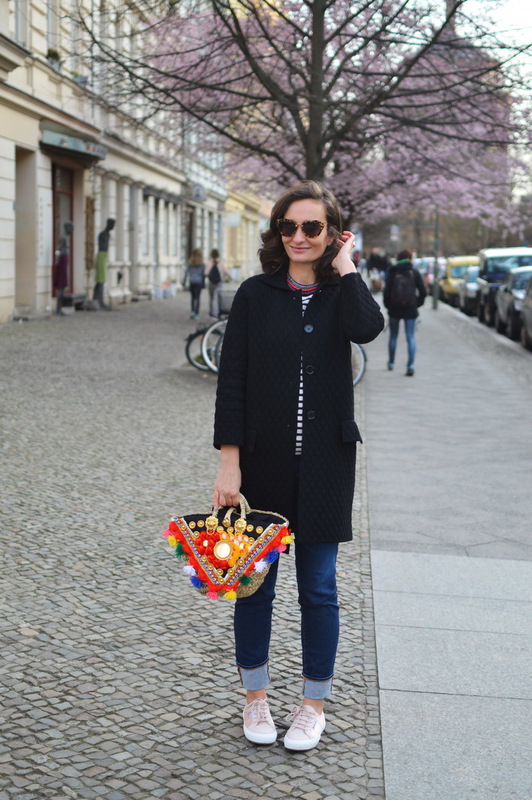 I am wearing: Quilted knitted coat by Max & Co. Cropped Jeans by AG Jeans. 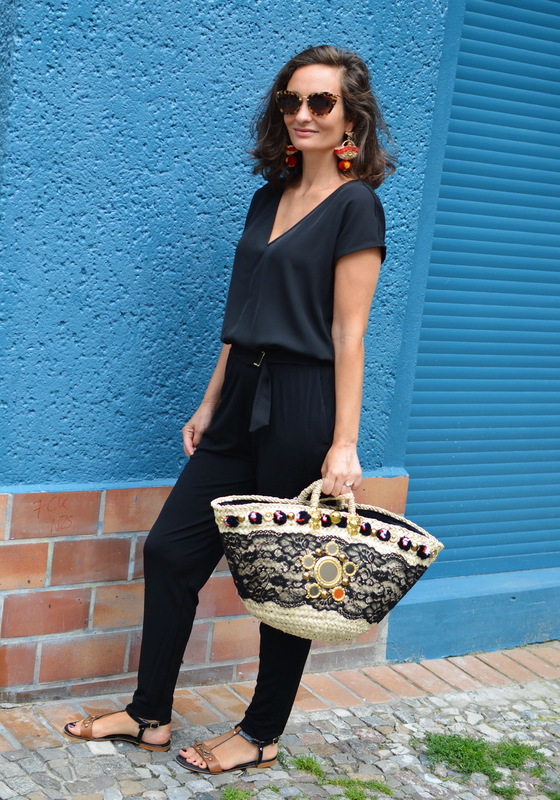 Straw Bag by Sicily Bag. Pink satin sneakers by Superga. Banana earrings by N2 Les Nereides. Meow! Who can spot the kitten heads within the florals? Coat by Paul and Joe sister. Boucle bag by Zara. Flashback to 2014 London Fashion Week and this fabulous waffle coat! Just a few weeks left of this longest winter in history, or at least it feels that way! Winter is still keeping us in it’s freezing grip as if to prove it still has a few weeks hold over us! It’s hard to find a coat that keeps you warm as well as looking decently stylish. The shearling coat is one of those and went through a renaissance last year thanks to Acne’s biker style shearling coat, worn by many celebs including our favourite style icon Alexa Chung. Formerly knows as sheepskin coat, the toasty jacket looks modern in urban shapes like a parka or a biker jacket. 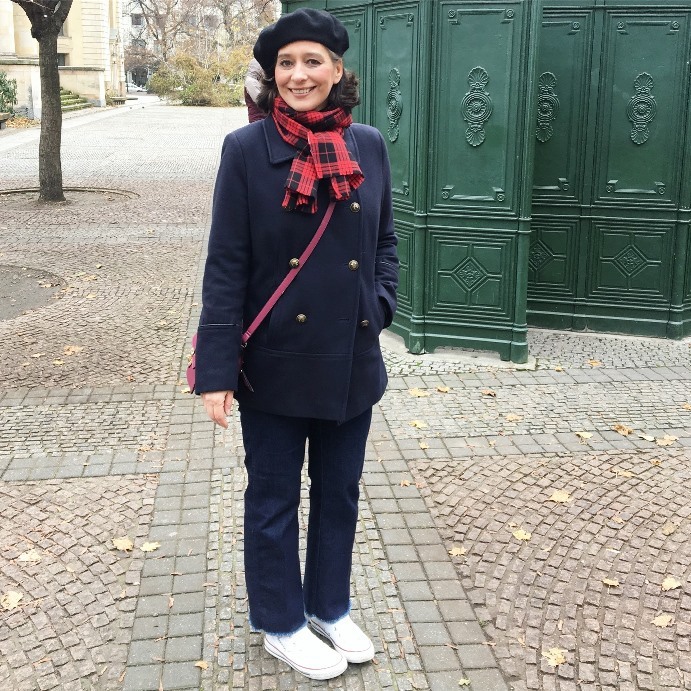 Its versatility is the biggest plus: Wear it up or down, pairing it with your cocktail dress or your jeans and breton shirt like Parisians do! 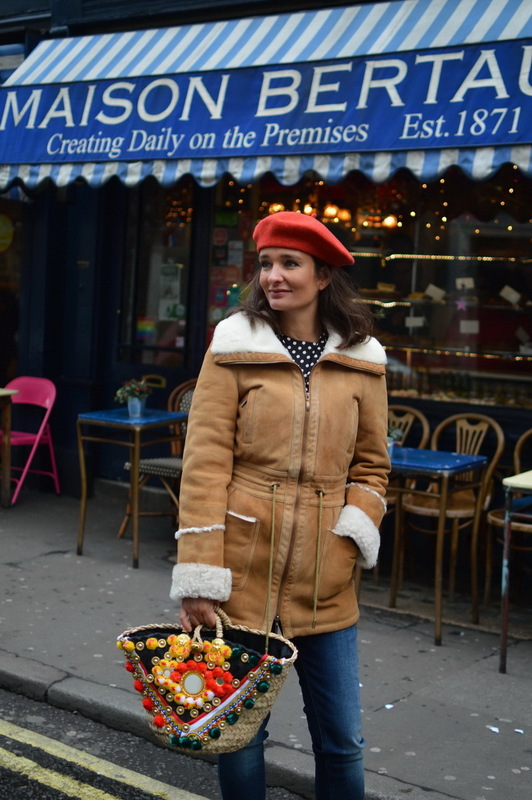 I’m giving my shearling parka (Stefanel) a French makeover, paired with red beret, casual jeans (Boss Orange) and chelsea boots (AGL). Sicilian embroidered basket by Sicily Bag. Alexa Chung going all British on us with her Burberry scarf and Acne velocite shearling jacket. Karli Kloss prooves that the shearling jacket can also be rocked over an romantique plaid skirt and boots. Winter style doesn’t have to be boring! Sub zero temperatures mean you can experiment with lots of knitted accessories, layering and toasty cocoon coats and throws. 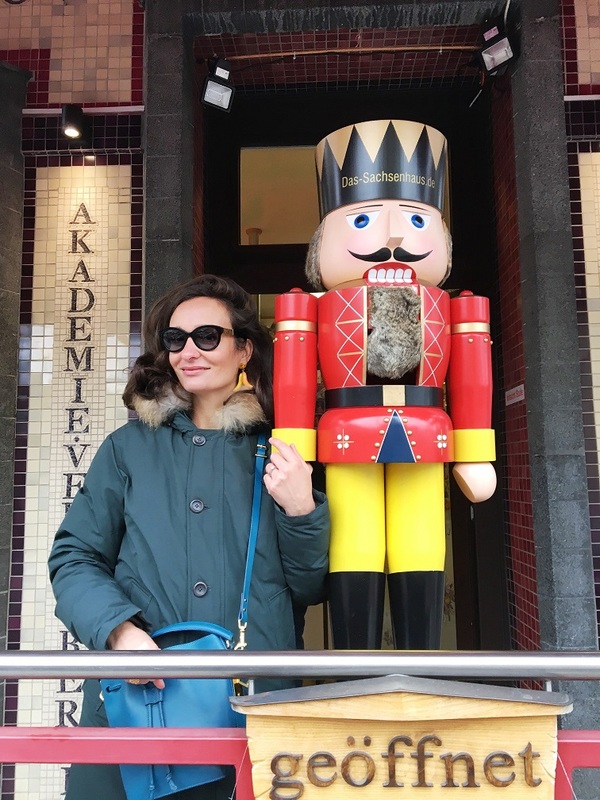 On a recent trip to the opening of the Christmas markets in Berlin, Rebel and I wrapped up warmly in our favourite winter staples to combat the cold. “Never without my converse chucks” is Rebel’s motto in winter too. Pop a lambskin insole into your Converse and you’re good to go in the colder season. 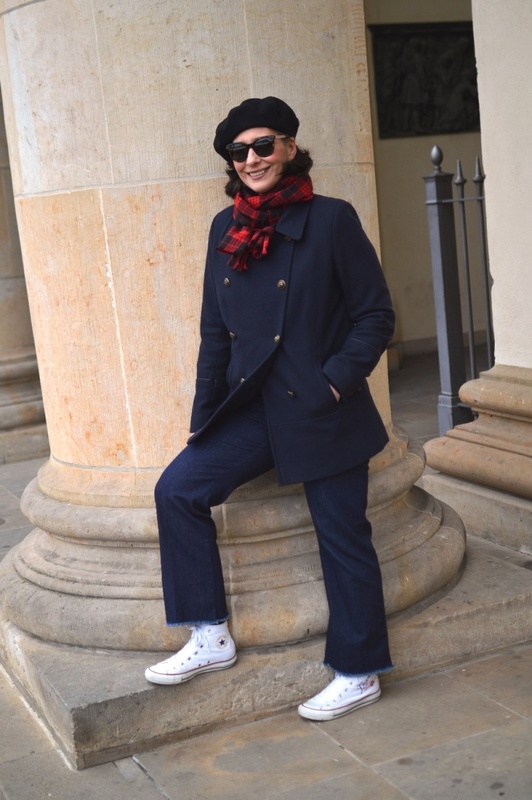 Complete the look with laid back, perennial French basics such as the beret and the nautical pea coat. A red checkered scarf provides a pop of colour in the bleaker season. Rebel is wearing: Pea coat by Calvin Klein. Beret by Seeberger. Culotte denim by Jbrand. Red checkered scarf by Gant. Personlised converse chucks. 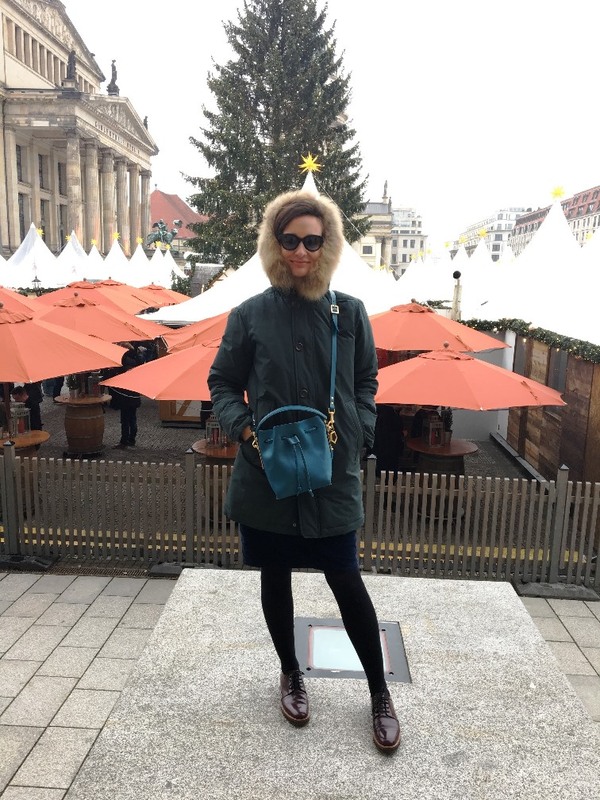 After moving from London to Berlin a few months ago, I decided I need an arctic parka to keep me warm in Berlin’s notoriously cold winter. I’ve been pampered by the ever so grey and wet but mild marine climate in the UK. After all, there’s no such thing as bad weather, just bad clothing! After plenty of research I invested in a classic green down parka with an over-sized, straight cut. It goes with virtually everything from my beloved round collar dresses to denim or skirts. I can even walk 4 km to work in this baby in -4 degrees and not feel the cold. 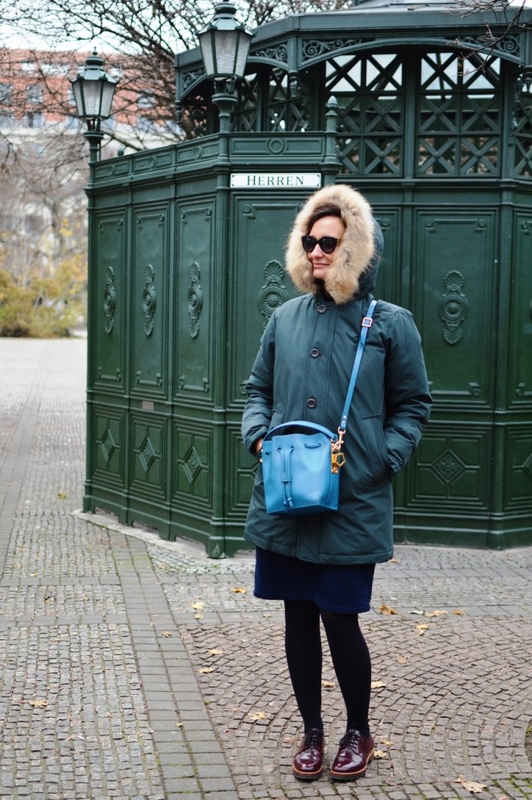 Romantique is wearing: Arctic down parka by HOX. Teal coloured bucket bag by Sophie Hulme. Bordeaux oxford lace-ups by Max Mara. Keeping the memory of summer alive with fun banana earrings. 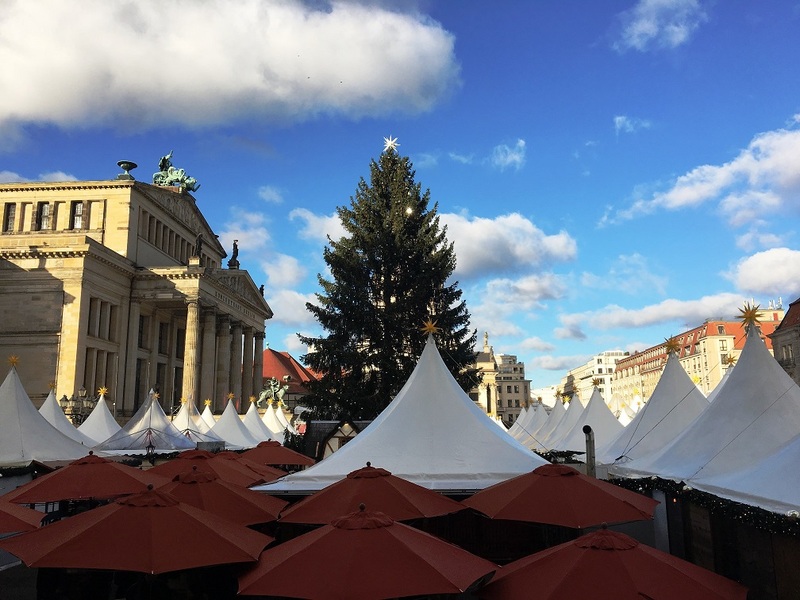 Overlooking Berlin’s most beautiful Christmas market at Gendarmenmarkt. I’ve always adored Alexa Chung’s French flair. Rebel and I often reference her effortless style. So what a lucky coincidence it was when I visited London on the precise weekend that Alexa launched her Marks & Spencer collection “Archive by Alexa”. Alexa raided the fashion archives of M&S to hand pick standout pieces and relaunch them, some with a contemporary twist. One of my good friends secured the pea coat coat “Templar” and I was sold instantly. The sailor coat with double breasted gold buttons, velvet stitched collar and princess cut is a French chic dream come true. Originally a children’s coat in the 90s, Alexa upsized and remodeled this gem to give 2016 a much needed boost! The good news for all Pan European fashionistas is that M&S deliver across Europe! So we can all indulge in a bit of Alexa Brit Chic! Style this classic coat like me with opaque tights and flat, knee-high boots, or try classic Alexa style with ankle boots and jeans. To make your ensemble even more “Alexa”, pair with a Jane Birkin style Sicily Bag or other straw accessory! Bucket by Sophie Hulme and brown flat boots by Sergio Rossi. The candy coloured Jackie Dress or why I love the 60s! We all know those days; the ones where you wake, sift through your overflowing wardrobe, and there is nothing to wear. 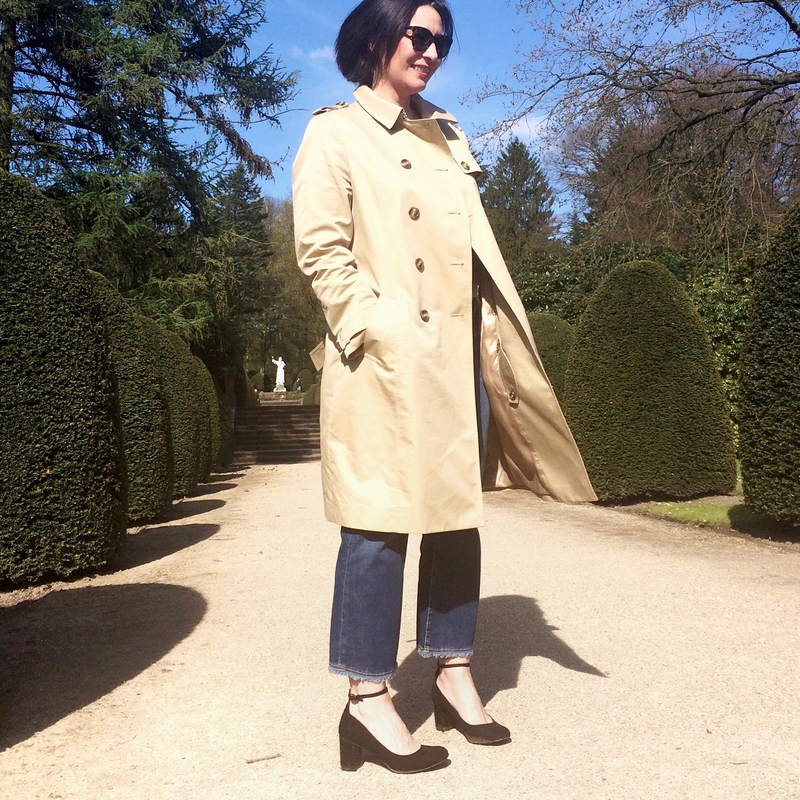 Nothing seems to align with your mood, fit with your new coat, complement your work shoes. The day has barely begun, you’re late for work and already pangs of stress are beginning! That’s the moment where I like to cut through the complexity and grab a simple dress. A dress so that I don’t have to worry about matching top to bottom. No pattern, just a mono coloured fresh hue complementing my skin, cut in a comfortable timeless shape. This is where classic brands like Max Mara are your best friends. No matter what the fashion fad du jour says, you can always rely on a simply cut dress in their collection. Jackie Kennedy knew that looking flawless is about the classic looks. Mind you she did live in the 50s / 60s , having the best fashion of the decade at her fingertips! 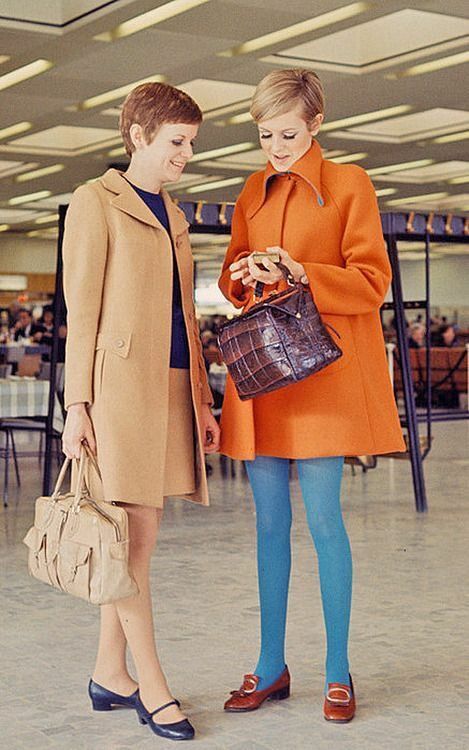 Good news for us is that 60s fashion looks incredibly modern today. Look at Twiggy and Grace Coddington below. These two would rock any street style competition in 2016! I’m wearing bordeaux coloured Oxford lace-ups to prevent this dress from looking too sugary sweet. Hand embroidered metal bracelet by Camille Enrico. I’m in love with these hand embroidered metal bracelets by the French designer. A piece of jewellry close to my heart as it was a present from the team I worked with previously in London. Dress and shoes by Max Mara. Raffia pom pom bucket bag by Sicily Bag. Sunnies by Prada. Jackie in the Pantone colour of the year 2016!